What is not to love about compound bows? I remember the first time I picked up one, it was love at first sight. And I bet am not the only one who feels this about compound bows. I mean truth be told, they are at times better than their recurve counterparts. Nonetheless, not every compound bow out there is worth your hard earned cash. Meaning that finding the best compound bow for the money can be difficult. Especially since the market is flooded with all kinds of bows. So how do you pick a bow that suits you best? Below is a comprehensive guide on what to consider when buying a compound bow. The guide comes complete with reviews of seven top rated compound bows. But first here is a comparison chart to help you understand why I have settled on the seven. Compound bows vary in their designs, size, and performance. As such, different bows (such as crossbow for hunting ) are designed for different purposes. When shopping for a compound bow, therefore, here is what you need to consider. Depending on why you are buying a compound bow it is important to consider the length. If you are buying a bow for hunting an extremely long bow will not be ideal. Longbows are heavy and difficult to maneuver in tight spaces. Short bows, on the other hand, are lighter and easy to maneuver but are not as accurate as their longer counterparts. Also for hunting it is ideal to get a best bow stabilizer for getting accurate and noise free shot. Therefore, if you want a bow for hunting settle on one that is around 32 inches. For target practice only, a longer bow of about 35 to 38 inches will be more ideal. Bow length is not the only length you should consider when buying a compound bow. Draw length is how far the string can be pulled before it stops. If you pick a bow with a short draw length it will be uncomfortable to use. On the other hand, a bow with an overly long draw weight will tend to be less powerful. Thus, when buying a bow test its draw length yourself to see if you are comfortable with it. Draw weight is the peak amount of weight you pull when drawing a bow. Generally speaking, compound bows increase in draw weight until a maximum weight is reached. Bows with a high draw weight fire arrows at faster speeds. However, this is not to say that more is better. The draw weight of your bow should match your ability. For teens and women, a draw weight of 45 pounds to 50 pounds is recommended. For muscular young adults and men, a draw weight of 60 to 70 pounds will do. It is important to keep in mind that different states have a minimum draw weight restriction. For most states, the minimum allowed draw weight is 45 pounds. As stated earlier longer bows are more accurate but are heavier than shorter bows. That being said, for hunting purposes, I recommend sticking to a lighter bow. Hunting involves a lot of movements and you do not want your bow weighing you down. For target practice, on the other hand, a longer heavier bow will not interfere with your comfort. Arrow speed denotes power. Thus, faster arrow speeds translate to a powerful bow. Also, a faster arrow will be able to pierce thick skins. It is for this reason that most hunters prefer bows with speeds of above 300FPS. For target practice, the arrow speed is not as important as the goal is to hit the target. To start us off, let us look at the best compound bows under 500. I have chosen two compound bows under this category. These are; the Bear Archery Cruzer G2 and the RAPTOR Compound Hunting Bow Kit. Without further ado, let us look at the two best compound bows for the money. It is not every day you come across a compound bow that appeals both to beginners and pro compound bow hunters. But this exactly what the Bear Archery Cruzer is. And it is no wonder some online reviewers have dubbed it the best compound bow for the money. After spending time with this piece of weaponry, here is what I think about it. When it comes to weight, there are few compound bows that are lighter than this one. Weighing only 3 pounds, it is lightweight and compact. In my opinion, this compound bow is easy to handle for just about anyone. The one thing that Bear Archery Cruzer bows are known for is adjustability. This is possible thanks to the dual cam system of the bows. The cams do not have an aggressive design, which makes them easy to draw. One of the reasons why this bow appeals to both beginners and pros is the adjustable draw weight. The draw weight can be adjusted from 5 to 70 pounds. What is more impressive is that the adjustments can be done with a simple Allen wrench. There is no need for a bow press to adjust the draw length. A highly versatile compound bow, the Cruzer G2 has all the features of a fantastic bow. The fact that you can adjust its draw weight and length makes it a unique offering. While it can be used by pro hunters, beginners and intermediates will find it more appealing. So, if you are looking for the best compound bow under 500, this is it. Sold at under $300, the Raptor compound hunting bow kit has all you need as an archer. A very well built bow, it is solidly built puts others on the same price tag to shame. Therefore, it is by far the best compound bow under 300 and here is why. Raptor is a company known for producing bows of high quality, and it does not disappoint with this one. The limbs are made of aluminum, which is both lightweight and tough. In this regard, you get a bow that is both light and tough enough to survive the outdoors. A bow press is necessary when adjusting the draw length of most bows. This is not the case with this raptor bow kit, as you can adjust the draw length without a bow press. As such, the bow is highly versatile and appeals to more people. Stealth is important to bow hunters, and Raptor knows this. It is for this reason that this bow comes with a string stabilizer and suppression. With it, you can hunt in silence and not spook your targets when firing. Most budget bows come with mediocre bow sights installed. Surprisingly, however, the Raptor Compound bow has a decent 5 pin sight pre-installed. This bow sight comes with 5 illuminated pins that are adjustable. With an affordable price tag and an easy to adjust draw length and weight, this bow is ideal for beginners, and intermediate archers. Nevertheless, given its can fire arrows at 315 FPS, it can also be used for bow hunting. In essence, this is a highly versatile compound bow fit for all. And it is for this reason that it is by far the best compound bow under 300. Launched in 2016, the BR33 Ready to Hunt Compound Bow is a unique offering from Bear Archery. Capable of firing arrows at 330 FPS it is suitable for any hunting application. More importantly, it is more accurate than most of its competitors. Unlike other similarly priced bows, this one does not require a bow press to adjust the draw length. It features a unique Draw-Dial system that comes with rotating modules. To adjust the length all you need to do is rotate the modules to a specific draw length and lock it down. The draw length can be adjusted from 27 to 32 inches. Made of Gordon glass, the pre-loaded quad limbs have a machined belly profile for distributing stress across the entire limb. The result of this is more stored energy, which results in more power. The quad limbs offer two separate draw weight configurations a 45-60 pound and 55 to 70-pound configuration. The inclusion of a sonic stop string suppression was done to dampen string vibration when the bow is fired. This means you get a bow that is both quiet and powerful. This compound bow comes in different colors, with the most popular being the Realtree Xtra Green camo finish. However, if camo is not your thing you can choose either olive, sand or shadow finishes. It is not as powerful as other similarly priced bows. This compound bow is a solid bow for hunting. It has all the features that a bow hunter would need. Its comfortable VersaGrip will appeal to hunters who hunt in cold weather. In essence, this is a compound bow designed with a hunter in mind. 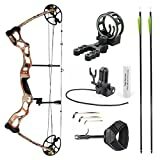 I read somewhere that the Diamond Archery Infinite Edge pro bow package can be used both by an 8-year-old and a 40-year-old seasoned archer. This made me want to check this top-rated compound bow for myself. I bought this bow almost two years ago and this is my honest opinion of it. Firstly, is that the patriot in me loves bows made in the USA. So I was happy with the fact that it is made in the country. In my opinion, this gives it an edge over other bows manufactured in China and other such countries. Adjusting the draw length and weight of this compound bow is easy. This is thanks to the rotating modules with three range settings. The three range settings are ABC, each of which has a varying draw length. Using a 9/64 inch hex wrench you can adjust the draw length from 13 inches all the way to 31 inches. While it can be used by an 8-year old, it is still a powerful bow. With a maximum draw weight 70 pounds, it can fire arrows at 310 FPS. Using 400-grain arrows you can achieve 65 pounds of kinetic energy. This energy is enough to take down the most big game in Northern America. The stabilizer included in this scope helps reduce string vibration. This goes a long way in achieving stealthy shooting. For hunting purposes, this is very important. In conclusion, the Infinite Pro bow package ticks all the right boxes. 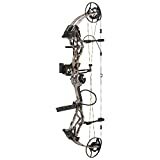 It is a lightweight and compact bow that does not compromise on power. Additionally, it is easy to adjust making it ideal for different situations. You can use it for target practice as well as for hunting. The Limited Edition RTH Coyote Brown is one of those bows that not many people are talking about. However, this is not to say its performance is poor. On the contrary, this is a bow capable of firing arrows at speeds of 330 FPS. You get an adjustable draw length of between 27 and 32 inches. This is a bit higher than that of other bows on this list but its still something. The adjustable draw length suits people of different frames. The 5 spot quiver holds arrows secure and as its name suggests can accommodate up to 5 arrows. The quiver helps keep your arrows secure when you are moving about. As with most other bows in this price range, it comes with a 5 pin bow sight included. This bow sight might not the best but will get the job done. It is a great addition and I don’t think you will need to change. The adjustable draw weight of 55 to 70 pounds suits large frame men more. Nonetheless, the draw weight helps the bow spit out arrows at 330 FPS. While it comes with adjustable draw length and weight, it is more suited to large frame men. The 55 to 70-pound draw weight will appeal more to men. Also, it is the Best compound bow under 1000 in regards to ease of use. 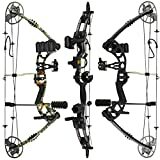 And compared to the other two bows on this category it is the best compound bow for hunting. While some compound bows are best suited for hunting others are best suited for target practice. Below are two of the best compound bow for target shooting. The Genesis Original Bow is the official bow of the National Archery in the Schools Program, which says a lot about its quality. A lightweight bow with a simplistic design, it is best suited for target practice. The first thing you notice about the bow is how minimalistic it looks. It lacks all the additional accessories you get with other bows. However, this is actually a good thing as most of the times the additional accessories are usually of low quality. With this bow, you get a simple looking bow that does what it is built to do. The adjustable draw weight on this bow will not appeal to seasoned archers but it is perfect for what the bow is built for. Using an Allen wrench you can adjust the draw weight from 10 to 20 pounds easily. Given it is designed for beginners, children, and youth, this bow needs to be lightweight. And that is exactly what it is. Weighing only 2 pounds, it is one of the lightest bows around. Nevertheless, this is not to say it is not tough. Important parts of the bow such as the riser are built from Machined aluminum, which is both tough and light. As I mentioned before, this bow does not come with any additional accessories. However, it is designed to accommodate these accessories. Towards this end, the riser is built to accommodate a number of accessories. It is important to remember that the Genesis Original is built for beginners and youth. Thus if you are a seasoned archer you are better off with another bow. Nevertheless, if you want a bow to introduce your kids to archery, this is the bow for you. It is light and can be used by children and teens of different age groups. Another bow that I consider to be the best compound bow for target shooting is the SAS Rage. Costing less than $200 this bow has a lot to offer. Something that surprised me when I first bought it. In fact, I was a bit skeptical at its price tag. I was not all that impressed with the design of the bow. However, given its price tag, it is something I could live with. The limbs are crafted from an inexpensive yet durable fiberglass material. The riser, on the other hand, is built from machined aluminum, which is impressive when I considered the price. I really loved the adjustable draw weight and the dual eccentric cam system. The latter system lets you adjust the draw weight by 5 pounds. The max draw weight is 70 pounds, which will appeal to most seasoned archers. Actually, I found that this bow can be used on small game. Is the SAS Rage a bow worth your money? Definitely yes. This bow is built for beginners and can withstand multiple misfires. Also, its draw weight is easy to adjust for people of varying archery experience. In essence, this is an inexpensive option for first-time archers that can be used by pro archers as well. The Leader Accessories Compound bow is an ideal bow for hunting as well as target practice. It is by far the best compound bow under 200. Constructed from high-quality aluminum this bow is suitable for hunting small game. Like all other bows on this list, this one comes with an adjustable draw weight and length. And the good thing is that you do not need a bow press to adjust the two. All that is needed is an Allen wrench, which makes the whole process easier. The 31-inch string on this bow is suited for beginners. When pulled the string can produce up to 7 pounds of energy. Additionally, it is non-stretchable. What this means is that it provides a good amount of resistance to provide arrows with sufficient energy. The bow can fire arrows at speeds of up to 310FPS. All the essential parts of the bow such as the riser and the limbs are made from aluminum. This makes it a lightweight yet tough bow. It can, therefore, survive harsh weather conditions. For hunting small game, this is a great product. Built for beginners it has a lot of features that newbie bow hunters will find useful. Also, due to its non-stretchable string, it produces a lot of energy without requiring a lot of draw weight. This is one of the reasons why it appeals to newbie hunters. 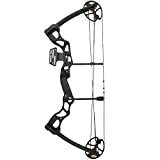 Thus, if you are new to bowhunting looking for the best compound bow under 200 this is the one for you. There are literally hundreds of compound bow models out there. However, not all are worth their asking price. When shopping for the best compound bow, do some homework before jumping into the market. There are many quality bows from the best compound bow brands that will not cost you much. It is my hope that this article has been of great help to you.